IDW Publishing has announced the promotion of Jerry Bennington from Director of Business Development to Vice President of New Product Development. Bennington’s primary role will be to further develop IDW’s emerging business units to include IDW Games, IDW Limited, and impulse pack product lines. A long-standing industry executive, Bennington previously served as Vice President of Marketing for Upper Deck Entertainment from 1999-2006. Under Bennington’s tenure, he established Upper Deck’s tabletop gaming division and generated over $2 billion in retail sales fueled by the Yu-Gi-Oh! Trading Card Game brand. Since joining IDW in 2012, Bennington has quickly helped establish several key platforms for company growth including IDW Games, which publishes the best-selling Machi Koro card game, IDW Limited, and impulse micro comics featuring My Little Pony, Teenage Mutant Ninja Turtles, and Star Wars brands with over 1 million packs produced to date. 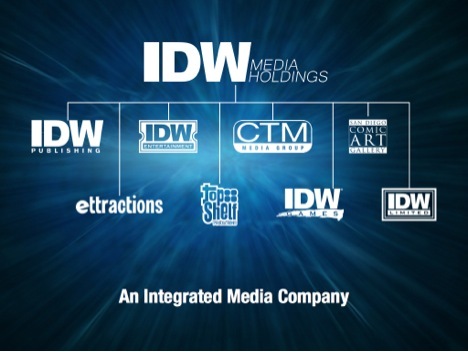 IDW Media Holdings, Inc. (formerly known as CTM Media Holdings, Inc.), announced today completion of a ten-for-one stock split. The split was effective on August 4, 2015. Each share of Class B Common Stock (including shares issued in the recent conversion of Class A Common Stock) and Class C Common Stock, now represents ten shares of the same class. The change has been effected in the records of the Company’s transfer agent. As part of an integrated effort, including the change of the Company’s name, it is expected that the post-split Class B Common Stock will begin trading under the ticker symbol (OTC PINK: IDWM) starting on August 10, 2015. IDW Media Holdings, Inc. is the integrated media company consisting of IDW Publishing, the award-winning, San Diego-based comic-book and graphic novel publisher; CTM Media Group, a distributor of print and digital advertising; IDW Entertainment, the television-development arm of IDW Publishing; San Diego Comic Art Gallery, a new comic art gallery space launched in summer 2015; Ettractions, a travel-based web portal; Top Shelf Productions, a publisher of independent and creator-driven graphic novels; IDW Games, producer of tabletop board games and card games; and IDW Limited, the high-end print collectibles division of IDW Publishing. Since making the name change to IDW Media Holdings in April, the stock has increased in value around 100% (as of the end of trading on 8/5). IDW Publishing was recently recognized with three Eisner Awards; prizes given for the top creative achievements within the comic book industry and announced that it will be doing comics based on Back to the Future and fan favorites Micronauts and Rom. IDW Entertainment announced that the SyFy Channel has acquired the U.S. rights to Wynonna Earp with an initial order of 13 one-hour episodes and USA Network has ordered a pilot for Brooklyn Animal Control. IDW Games announced its hit card game, Machi Koro has topped 100,000 copies and a deluxe edition is scheduled for the holiday season. CTM Media Holdings, Inc., a holding company consisting of CTM Media Group and a majority interest in IDW, announced today that it will begin operating under the name IDW Media Holdings to reflect the growth of IDW as its principal line of business, and Ted Adams, a founding partner and current CEO and Publisher of IDW, will take over as CEO of IDW Media Holdings. A holding company is a company that doesn’t actually produce and goods or services, it just owns shares of other companies and forms a corporate group. It helps owners control a number of different companies and reduces the risk for owners. IDW Media Holdings, Inc. will be an integrated media company consisting of IDW Publishing, the award-winning, San Diego-based comic-book and graphic novel publisher; CTM Media Group, a distributor of print and digital advertising; IDW Entertainment, the television-development arm of IDW Publishing; San Diego Comic Art Gallery, a new comic art gallery space launching in summer 2015; Ettractions, a travel-based web portal; Top Shelf Productions, a publisher of independent and creator-driven graphic novels; IDW Games, producer of tabletop board games and card games; and IDW Limited, the high-end print collectibles division of IDW Publishing. CTM Media Holdings currently has two classes of common stock listed on the OTC Pink Sheets Pink Tier under the symbols CTMMA and CTMMB. As part of an integrated effort to boost the presence of the Company, IDW Media Holdings will register its common stock under the Securities Exchange Act of 1934 and seek to list its shares on a national securities exchange with a ticker symbol reflecting its updated identity. IDW Limited Unlocks the Mysteries of the Key House. The story of Locke & Key may be coming to a close, but IDW Limited is just getting started. 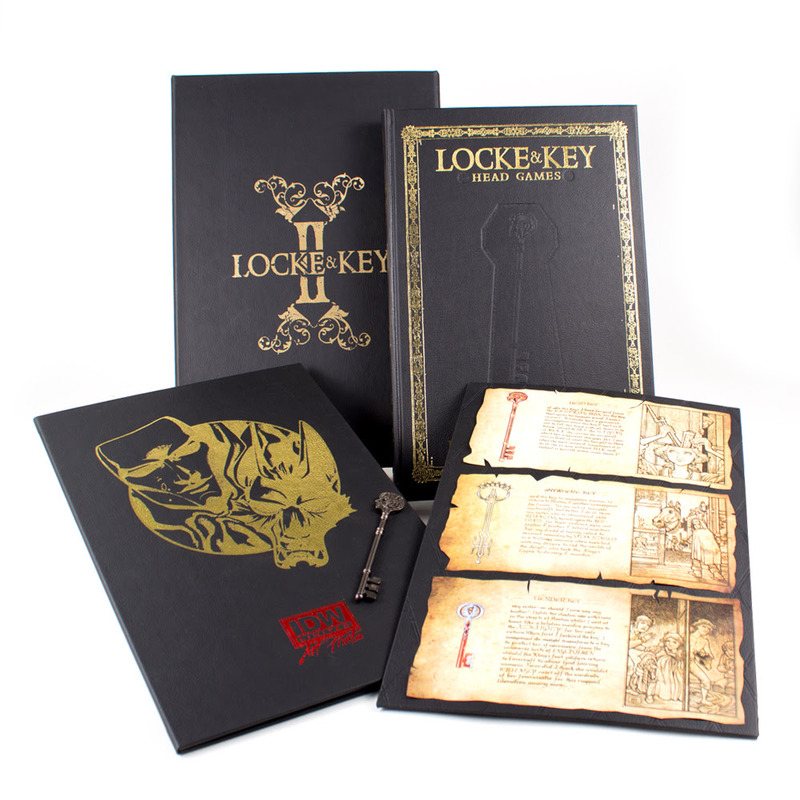 Available today from IDWLimited.com, fans can pre-order Locke & Key: Head Games in a new deluxe, limited-edition format. This oversized hardcover comes packaged in an exclusive tray case and cover only available through this release. Each book is packed with extras, including: an exclusive photo portfolio, a Head or Echo Key produced by Skelton Crew Studios just for this edition, and a secret compartment containing pages from the Locke family journal! Black and Blue Label editions of this limited-edition collection will feature original art from an impressive group of artists, including David Petersen, Langdon Foss, Alan Robinson, and Jim Mahfood. Black Label books (10 copies available per artist) will feature artists working on a sketch plate with a background by Gabriel Rodriguez, while Blue Label books (3 copies per artist) will come with a cover interpretation by the guest artist. Locke & Key: Head Games is available now on idwlimited.com – pre-order now before you’re locked out. To celebrate their first twelve months of deluxe hardcover offerings, today IDW Limited announced a 72-hour flash sale event. For the next three days IDW Limited will offer discounts on the remaining copies of several of its rare limited-edition titles. Ranging from Transformers to My Little Pony to creator-owned projects like Monocyte and Crawl To Me, the sale will have something for everyone. There will also be several never-before-seen items available only during this three day period including hand-drawn sketch covers from rock poster artist, Munk One. Besides the sale there will also be several giveaways and contests designed around fan interaction, culminating in a fan art contest featuring one of IDW’s marquee series. New items will be added each day, with announcements being made through IDW Limited’s social media channels Facebook and Twitter. With discounts as steep as 50%, the already limited inventory on the deluxe hardcover site is likely to move fast. Fans would be wise to start shopping early if they hope to take part in the sale. Today IDW Limited announced the release of Woodwork: The Complete Work of Wallace Wood (1927-1981) in a deluxe, limited-edition format. The book features an exclusive cover and slipcase, a hardcover portfolio containing eight lithograph prints and a signed and numbered photograph taken by Wallace Wood’s longtime friend and personal photographer Gilbert Ortiz. There’s a little touch of Wood inside each book, as they have been individually hand-stamped by Wood’s own Snorky stamp, loaned to IDW Limited by the Wood estate specifically for this release. Limited to just 150 copies, this IDW Limited Black Label edition collects decades of work and hundreds of beautifully captured pieces of Wood’s art. From his days at EC to his self-published work to T.H.U.N.D.E.R. Agents, this is an insider’s view of the complete career of Wallace Wood. Housed in a custom slipcase and accompanied by a portfolio full of lithographs on high-quality 300-gsm paper, this book has been painstakingly designed to be the perfect showpiece for discerning collectors. Available now from IDW Limited.com, this deluxe hardcover is a piece of comic history. IDW Limited brings you Feldstein: The MAD Life and Fantastic Art of Al Feldstein! Feldstein: The MAD Life and Fantastic Art of Al Feldstein is both a full biography and a coffee-table art book, spanning his entire life and career. Along with rare and previously unpublished photographs, this full-color book pictures every one of Feldstein’s EC comic book covers (many placed alongside the original artwork), several complete EC stories, plus nearly every splash page and house ad Feldstein did for EC. It traces his nearly thirty-year career as the editor of MAD, and presents his post-retirement work as a “fine” artist, including his prize-winning Western canvases and his many commissioned paintings “revisiting” his classic cover images from the 1950s. Author Grant Geissman pulls from all aspects of Feldstein’s life, not all of it sweetness and light. The exclusive IDW Limited cover features a beautiful Feldstein painting featuring EC’s horror hosts the Three GhouLunatics, various creatures, and a Svengali-like image of EC and MAD magazine publisher Bill Gaines. It’s a perfect homage and finishing touch to this remarkable edition. The book is now available and in stock on http://idwlimited.com/books.html and you’d be MAD not to order a copy immediately! With joy in their hearts, IDW Limited announced plans today for a deluxe hardcover version of My Little Pony: Friendship Is Magic, Vol. 1. In order to celebrate what is their biggest book project to date, they’re doing something extra special. The book will be custom designed in six ultra-exclusive variant offerings, one for each member of the hit animated TV series core cast. Starting Monday, the site will begin taking pre-orders on one variation of the book beginning with Rainbow Dash, and continuing with Twilight Sparkle on Tuesday, and rounding out the week with Fluttershy, Pinky Pie, Applejack and Rarity. 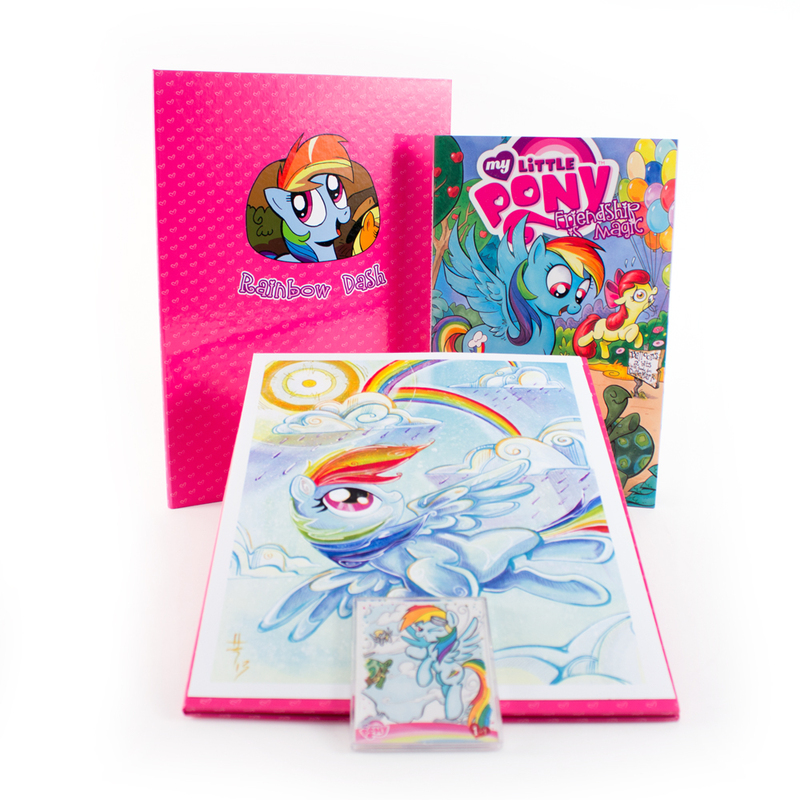 My Little Pony: Friendship Is Magic deluxe hardcover is available for pre-order now. Dash on over to IDWLimited.com to secure your copy now! Today, IDW Limited announced their new KISS Solo Comicfolio line and the God of Thunder has declared these collectibles “Hotter Than Hell!” Beginning with The Demon, all four KISS Solo comics will be available for pre-order in special-edition Comicfolio format. Celebrating the KISS Solo series in a truly unique collectible format, this launch is guaranteed to rock and roll all night long. Each KISS Solo Comicfolio contains a special-edition version of the Angel Medina cover and an exclusive lithograph packaged in a laser-cut hardcover portfolio featuring the band’s logo. The first book to receive this treatment will be The Demon, with The Starchild, The Celestial and The Catman to follow in short order. Fans can also choose to pre-order The Beast, featuring all four KISS SOLO Comicfolios at a special price. With limited print-runs and top-notch designs these Comicfolios are sure to go platinum. So rock and roll over to idwlimited.com for your exclusive KISS Solo Comicfolio today.